Nia Vardolos shares some never before heard behind the scenes moments. It's been 16 years since the indie romantic comedy "My Big Fat Greek Wedding" hit theaters, but for leading actress and writer Nia Vardalos, the timeless family film still holds a special place in her heart. Vardalos stars in the movie as Toula Portokalos, a 30-year-old unmarried waitress at her father's Greek restaurant, Dancing Zorbas, when she meets the love of her life and breaks cultural barriers while providing a movie full of hearty laughs that are based on her own real-life experiences. Vardalos spoke with ABC News' "20/20" about some behind-the-scenes smooches and other stories from the set. Here are five things you might not know about "My Big Fat Greek Wedding." Watch the special edition of "20/20," "Lights, Camera, Romance," airing Tuesday, Feb. 13 at 10 p.m. ET. She said that the show began selling out and Greek actress Rita Wilson called asking for tickets. Immediately after the performance, Wilson told Vardalos she loved it, “And she said, ‘This should be a movie,’” Vardalos recalled. 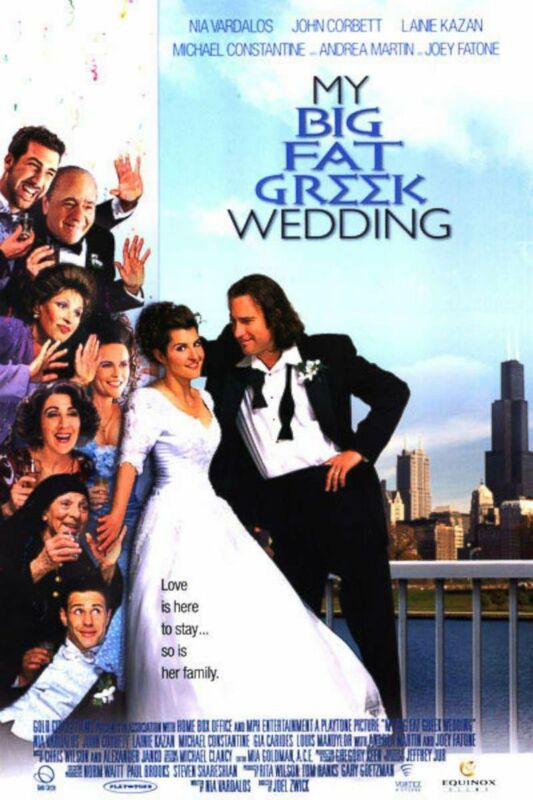 (Gold Circle Films) A poster of the movie "My Big Fat Greek Wedding." Vardalos said she wanted actor John Corbett to play Toula’s love interest, Ian Miller. They both waited as Corbett was talking to the bartender who asked what film he was working on next and overheard him say, “‘I don't know, but I just read this script in my room, ‘My Big Fat Greek Wedding,’ and I'm gonna be in it." Goetzman approached Corbett about the movie and found out that not only was he interested but he was available after all. They began filming four days later. (Gregg DeGuire/WireImage via Getty Images, FILE) John Corbett and Nia Vardalos during The 29th Annual People's Choice Awards at Pasadena Civic Auditorium in Pasadena, Calif., in this Jan. 11, 2003 file photo. Vardalos told Corbett that since everyone would be watching them and she’d never done a kissing scene before that she wanted to “get it over with” ahead of time. As Corbett walked out of the makeup trailer, Vardalos stopped him and said, "I'm really nervous about everyone seeing it, and could you just -- could you just kiss me right now and let's just get it over with?" “And he goes, ‘Right now?’ And I go, ‘Yeah, just kiss me right now.’ And he goes, ‘OK.’ So he just kissed me, right now. And I was like, ‘Oh, that was easy.’ So by the time we were on the set filming it four hours later, it was fine. It was easy. I wasn't embarrassed,” the actress said. It wasn’t until years after filming that they pair found out they’d been caught in the act. “We found out years later that the hair artist on the movie had come out of the makeup trailer at that moment, seen us kissing, and went, ‘Oh, they're having an affair,’” Vardalos said laughing. Vardalos said that while filming the scene when she works at her aunt and uncle’s business, Olympus Travel Agency, her mother watched from behind the scenes and freaked out during the famous headset scene when she falls backward. “Here we were, filming this big scene where, the way you do it is you take two steps and then they throw a big mattress in behind you so that when you fall, you don't break your head,” she explained. Some of the side-splitting one-liners that Vardalos included in the movie were things that her family actually said to her at some point -- including one real-life situation when she was making fun of her mom for “being a docile Greek woman” and her response left her speechless. “I've grown up basically hearing stuff that, at the time, you accept as truth, but then later, you go, ‘What?’ Like, ‘Greek women. We might be lambs in the kitchen, but we're tigers in the bedroom,’ is something that my mother said to me while we were making chicken soup. “So I threw up in my mouth. And then I wrote it down,” she said. “When I started to write ‘My Big Fat Greek Wedding,’ all I did was write down everything that had ever happened to me,” she said. (Universal Pictures) Andrea Martin and Nia Vardalos appear in "My Big Fat Greek Wedding 2." Vardalos even requested Andrea Martin play her quirky aunt.